1. Apartment Building on Ave-Jerome Park, Sabraton, W. Va. Apartment Building on Ave-Jerome Park, Sabraton, W. Va.
Monongalia County Building and Loan Association. 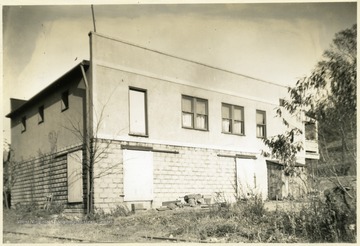 Building on Ave-Jerome Park. Distict: Sabraton; From who aquired: Guariglia, Angelo R.; Address of property: Ave-Jerome park, Sabraton; Description: Lots 12, 13, 14, Bk 12 Sabraton, Lots 10 to 16 Inc. Bk 3 Sabraton, Lots 11, 14, 15, Bk 7 Sabraton, Lots 1, 2, Bk 4 Sabraton; Improvements: Large brick store building about 35x60' with six room apartment and bath on second floor, basement, furnace. Also small frame dwelling, three rooms, composition roof. 2. Hotel and Dunlop Tire Store, 1253 University Avenue, Third Ward, W. Va.
Hotel and Dunlop Tire Store, 1253 University Avenue, Third Ward, W. Va.
Monongalia County Building and Loan Association. 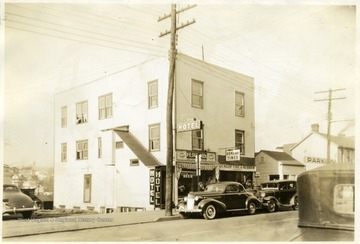 District: Third Ward; From whom aquired: Globe Realty Co. '#2 Star Hotel-Shisler'; Address of property: 1253 University Avenue; Description: Pt lot 3 University Avenue 87.5x100'; Improvements: Building with two store rooms on first floor, two floors above rented as hotel, frame construction, composition roof. 3. 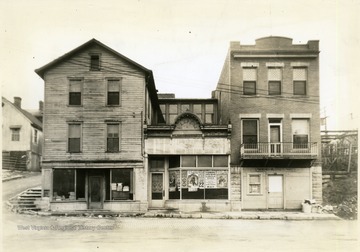 Grocery Store and Upstairs Apartments, 1279 University Avenue, Third Ward, W. Va. 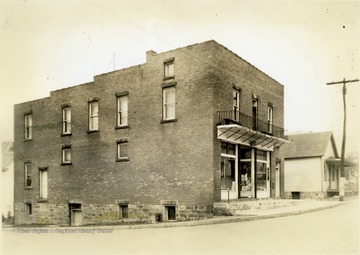 Grocery Store and Upstairs Apartments, 1279 University Avenue, Third Ward, W. Va.
Monongalia County Building and Loan Association. Business on 1279 University Avenue in Third Ward. District: Third Ward; From whom aquired: Globe Realty Co. '#1 Denny' Address of property: 1279 University Avenue; Description: Pt lot 2 University Avenue 43.9x160'; Improvements: Building with two store rooms on first floor, apartment on second floor, basement, parking lot in the rear, frame construction, tin roof. 4. 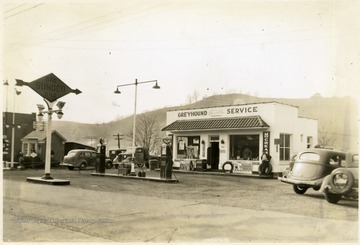 Sunoco Station and Greyhound Service on University Avenue, Morgantown, W. Va.
Sunoco Station and Greyhound Service on University Avenue, Morgantown, W. Va.
Monongalia County Building and Loan Association. District: Third Ward. From Whom Acquired: Lepera, Louie # 3 (Service Station). Address of Property: University Avenue-Near B. &amp; O. Station. Description: Lot 7 pt of 6 University Avenue 99.75' on University Avenue x 118.' 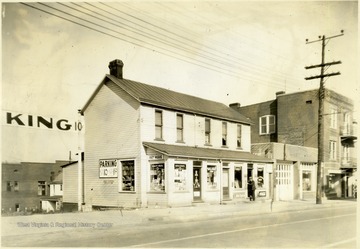 Improvements: Greyhound service station, ten year lease to Sun Oil Company, dated Nov. 11, 1932, rent of $60.00 per month and 1/2 cents per gallon on all sales of Blue Sunoco gasoline per month in excess of 6000. gallon. 5. Hotel on Moore and Garrett Streets, Morgantown, W. Va.
Hotel on Moore and Garrett Streets, Morgantown, W. Va.
Monongalia County Building and Loan Association. District: Third Ward. From Whom Acquired: Lepera, Louie # 4 (Hotel). Address of Property: Moore and Garrett Streets. Description: Pt. Lot 6 - 57.6' on Moore Street 56.6' on Garrett Street x 54.4' near B. &amp; O. Station. 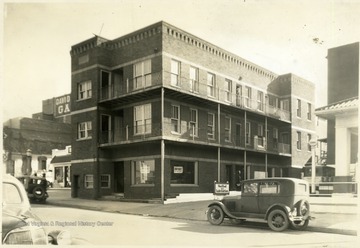 Improvements: Brick and frame hotel, about twenty rooms, steam heat, two store rooms in basement, two floors above occupied as hotel. 6. Store and Apartments, 732 Richwood Ave., Morgantown, W. Va.
Store and Apartments, 732 Richwood Ave., Morgantown, W. Va.
Monongalia County Building and Loan Association. District: Fifth Ward. From Whom Acquired: Bucklew, J. Mason. Address of Property: 732 Richwood Ave. Description: Pt. Lot 5 Block 1 Rogers East End Add. Improvements: Store Bldg., Also two apts. on second floor each with four rooms and a bath, concrete block construction, composition roof, steam heat in store room only . 7. 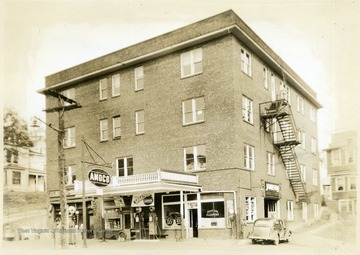 Amoco Station and Apartments on University Ave. and Stewart Streets, Morgantown, W. Va.
Amoco Station and Apartments on University Ave. and Stewart Streets, Morgantown, W. Va.
Monongalia County Building and Loan Association. District: Fourth Ward. From Whom Acquired: Shuman McCue # 1. 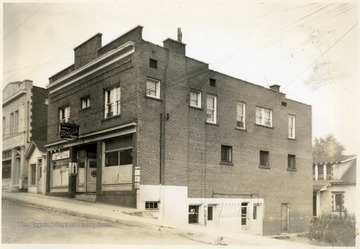 Address of Property: University Ave. and Stewart Street. Description: University Ave. and Stewart Street. Three bldgs. 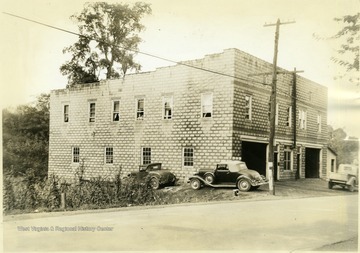 Improvements: Brick bldg with steel and concrete reinforcement, four floors, tin roof, steam heat, occupied as service station, grocery store, cleaning and pressing, two garages and office space. 8. Garage and Apartment Building on Pennsylvania Ave., Westover, W. Va.
Garage and Apartment Building on Pennsylvania Ave., Westover, W. Va.
Monongalia County Building and Loan Association. District: Westover. From Whom Acquired: Savides, Vasel. Address of Property: Pennsylvania Avenue-Westover. Description: Lots 15, 17, 18 Bk 1 Westover Dev. Co. Improvements: Garage bldg, concrete block construction (occupied by state road commission), four three-room apartments and bath above. 9. Warehouse and Apartments, 429 University Avenue, Morgantown, W. Va. 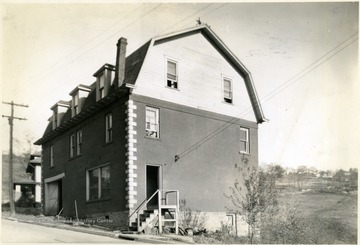 Warehouse and Apartments, 429 University Avenue, Morgantown, W. Va.
Monongalia County Building and Loan Association. District: First Ward. From Whom Acquired: Hough and Furman. Address of Property: 429 University Avenue. Description: Lot 50 x 125' University Avenue. Improvements: Warehouse on first floor, five room apartment on second floor, concrete block construction, composition roof, railroad siding. 10. Garage with Apts at 800 Willey Street, Morgantown, W. Va.
Garage with Apts at 800 Willey Street, Morgantown, W. Va.
Monongalia County Building and Loan Association. District: Fifth Ward. From Whom Acquired: Growall, H. M. Address of Property: 800 Willey Street. Description: Lot 1 Bk 3 Willey Street. Improvements: Garage bldg with two apts above, brick construction, composition roof. 11. Apartment Building, 1308 University Avenue, Morgantown, W. Va. Apartment Building, 1308 University Avenue, Morgantown, W. Va.
Monongalia County Building and Loan Association. District: Third Ward. From Whom Acquired: Corey Apts. (Walter L. Corey). Address of Property: 1308 University Avenue. Description: Part Lot 25 on Front Street 33 x 78'. Improvements: Eight three and four room apts and one store room, brick construction, composition roof, steam heat. 12. 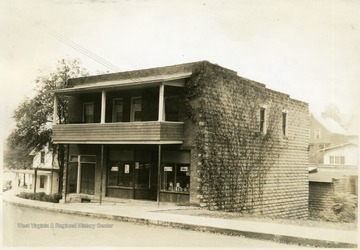 Barber Shop and Apartments, 457-9 Wilson Avenue, Morgantown, W. Va.
Barber Shop and Apartments, 457-9 Wilson Avenue, Morgantown, W. Va.
Monongalia County Building and Loan Association. District: Second Ward. From Whom Acquired: Cola vincenzo, Salvatore. Address of Property: 457-9 Wilson Avenue. Description: Lot 2 Bk 19 Reay Plan 40 x 65. Improvements: Brick bldg with two store rooms, two apts on second floor, one apt in basement also barber shop and pressing establishment.